Pro-Apartheid Trump America and US lackey Australia merit international Boycotts, Divestment and Sanctions (BDS) as the only countries to vote against the UN Human Rights Council’s resolution to formally investigate the latest Israeli Gaza Massacres in which Apartheid Israeli soldiers have shot 116 unarmed Palestinian protestors and injured about 13,000. No Israeli soldiers have been killed or wounded and no Palestinians protestors penetrated the barbed wire surrounding the Gaza Concentration Camp. Just as a galvanized world successfully boycotted Apartheid South Africa after the 1960 Sharpeville Massacre (69 unarmed African protestors killed and 220 wounded), so the world must respond to the latest Gaza Massacres with BDS against Apartheid Israel and all people and countries supporting this genocidally racist obscenity. The latest Gaza Massacre started on 30 March 2018 with cowardly and war criminal Israeli Defence Force (IDF) goons shooting unarmed Palestinian protestors taking part in the Great March of Return and expressing the right under International Law of 7 million Palestinian exiled refugees to return to their Homeland, Palestine. The latest and worst of this series of Gaza Massacres occurred on 14 May 2018 as the Americans, Israelis and contemptible foreign delegates celebrated the 70th anniversary of the creation of Apartheid Israel and the opening on that anniversary of the US Embassy on stolen Palestinian land in Jerusalem in flagrant violation of International Law, UN Conventions and numerous UN Resolutions. As of 19 May 2018, since 30 March 2018 the Israelis have killed 116 unarmed Palestinian protestors, wounded 3,569 with live ammunition and caused 12,733 injuries [1, 2] . No Palestinians penetrated the barbed wire surrounding the Gaza Concentration Camp and no Israelis were killed or wounded (1 Israeli soldier was slightly wounded). Just as those who supported Nazi Germany could be reasonably described as “pro-Nazi”, so those going to great lengths in supporting Apartheid Israel can be quite reasonably described as “pro-Apartheid”. Both Trump America and US lackey Australia under Christian Zionist PM Malcolm Turnbull are #1 and #2, respectively, in the world as fervent supporters of Apartheid Israel. Thus Trump America and US lackey Australia totally rejected the 2016 UN Security Council Resolution 2334 (unanimously passed except for an Abstention from Obama America) that condemned gross Israeli violations of International Law in the Occupied Palestinian Territories (occupation, the seizure, gross violation and ethnic cleansing of the Indigenous population, illegal settlements, theft of Jerusalem and forced conversion of Indigenous Palestinian citizens of Jerusalem to non-voting citizens of the State of Israel) [3-6]. Similarly, Trump America and US lackey Australia totally rejected the UN Human Rights Council’s resolution to formally investigate the latest Israeli Gaza Massacres in which Apartheid Israeli soldiers shot 116 unarmed Palestinian protestors and injured about 13,000. Because of backing by the US and the US Alliance, genocidally racist Apartheid Israel has got way with immense, Nazi-style crimes against humanity over the last 70 years – it has occupied all of Palestine plus neighbouring territories; the ongoing Palestinian Genocide has been associated, so far, with 2.3 million Indigenous Palestinian deaths from violence, 0.1 million, or imposed deprivation, 2.2 million, since the British invasion of Palestine in WW1; 90% of Palestine has been ethnically cleansed, 7 million Palestinians are totally excluded from Palestine, and 14 million Palestinians are excluded from all or part of Palestine; 5 million Occupied Palestinians (half children and three quarters women and children) are indefinitely, criminally, violently and highly abusively incarcerated without human rights in the Gaza Concentration Camp (2 million) or in West Bank ghettoes (3 million) [3, 6-19]. There is no evidence for the Exodus from Egypt (the endlessly recording Egyptians left no record of it) , for a huge David and Solomon Jewish Empire (a solitary stone has been found in Syria with the name David inscribed on it in an ancient Semitic script), or for the 1st century CE mass Exile of Jews from Palestine under the Romans . However it is clear from the Biblical accounts that numerous other peoples inhabited Palestine BCE and successfully withstood the Bible-recounted attempts by the genocidally racist Israelites to exterminate them, notably the Philistines from whom Palestine derives its ancient, 3,000-year old name. If we are to believe the Bible, (a) David was a genocidally racist psychopath who totally exterminated Palestinian communities including Jerusalem, the city of the Jebusites, and (b) 5,000 years old Jerusalem was only substantially inhabited by Israelites for 2 short periods, specifically 1,000-586 BCE (from ethnic cleansing by David until destruction by the Babylonians) and thence from 586BCE-638CE (variously as a minor, multi-ethnic satrap of the Babylonian, Persian, Greek, Western Roman, Eastern Roman and Seleucid Persian Empires until Muslim conquest in 638CE). Apart from rule by the Crusaders (1098-1187 and 1229- 1244) and the Khwarezmian Tatars (1244-1247), Jerusalem was ruled by Muslims from 638CE until conquest by the genocidal British in 1917. Italians have more claim to London than Zionists to Palestinian East Jerusalem (London was founded, ruled and expanded by the Romans over 5 centuries ) . Indeed from a Palestinian perspective, from the genocidally violated Jebusites of 1000 BCE to the genocidally violated Indigenous Palestinians today in the 21st century CE, genocidally racist Zionists are the very last people in the world who should be ruling conquered, occupied and grossly violated East Jerusalem . Of course the 2018 Gaza Massacres (116 killed, 13,000 wounded) were preceded by even worse Gaza Massacres. In the 2008-2009 Gaza War (called Operation Cast Lead by the Israelis) about 1,400 Palestinians were killed and 5,300 were wounded. 13 Israelis were killed, this including 10 from friendly fire and 3 civilians. In 2012 the 1-week Israeli Operation Pillar of Defense, 220 Palestinians were killed, half civilians, and 1,000 wounded, as compared to 2 Israeli soldiers killed and 20 wounded). In the 2014 Gaza Massacre (called Operation Protective Edge by the Israelis) 2,300 Palestinians were killed (including about 1,500 civilians) and 10,600 were wounded. 73 Israelis (66 of them soldiers) were killed. Only 34 Israelis have been killed by Gaza rockets [21-23]. However it gets worse. Of the 2.3 million Indigenous Palestinians who have died prematurely since the British invasion in WW1, only 100,000 were killed violently, the remainder dying prematurely from imposed deprivation . It is estimated that each year about 500 Palestinian are killed violently  but a further 4,200 die prematurely annually from imposed deprivation . The per capita GDP for Occupied Palestinians is $2,900 as compared to $38,000 for Apartheid Israel . An alternative estimate has a per capita GDP for the West Bank and Gaza as $1,924 and $876, respectively  . Yet in look-the-other-way Australia decent people protest while the Coalition Government lauds the miserable social welfare support for unemployed, crying “Could you live on A$40 per day?” (A $14,610 per year or US$11,103 per year). Poverty kills . The bottom line in any sensible, humane argument about Palestine is that the Occupied Indigenous Palestinians (like everyone else) must have all the human rights as set out in the Universal Declaration of Human Rights but which are presently comprehensively denied them by Apartheid Israel. In particular, of the 6.8 million Palestinian subjects of Apartheid Israel who now constitute 50% of the population, 74% are precluded from voting for the government ruling them i.e. they are subject to egregious, Nazi-style Apartheid, a crime against Humanity according to the UN  . The Humanity-threatening awfulness of the Occupied Palestinians’ egregious and deadly poverty has been utterly avoidable. Decent Humanity demands all human rights for the Palestinians and a generous and genuine movement to maximize health, life expectancy, happiness, opportunity, and dignity for these sorely oppressed people. The “2-State Solution” for Palestine has been a dishonest, disingenuous Western excuse for inaction and is now dead because of the ethnic cleansing of 90% of the land of Palestine. However, a peaceful , humane solution informed by the post-Apartheid South African experience is for a Unitary State in Palestine with return of all refugees, zero tolerance for racism, equal rights for all, all human rights for all, one-person-one-vote, justice, goodwill, reconciliation, airport-level security, nuclear weapons removal, internationally-guaranteed national security initially based on the present armed forces, and untrammelled access for all citizens to all of the Holy Land. It can and should happen tomorrow – but won’t because of the racist intransigence of US-, Australia, US Alliance- and EU-backed Apartheid Israel. In the face of continuing Occupation, continuing Exile, continuing Apartheid and ongoing Palestinian Genocide, the world must act against Apartheid Israel with Boycotts and Sanctions as it successfully did to Apartheid South Africa. Peace is the only way but silence kills and silence is complicity. All decent Humanity must (a) inform everyone they can, and (b) urge and apply Boycotts, Divestment and Sanctions (BDS) against Apartheid Israel and all people, politicians, parties, collectives, corporations and countries supporting this genocidally racist, nuclear terrorist rogue state. But in considering Sanctions, how to determine Good, Bad and Rotten opinions when it comes to international responses to the appalling lot of Occupied Palestinians? Global responses to the present Gaza Massacres provide a useful measure of culpability in the vile oppression of the Palestinians (50% children, three quarters women and children) as outlined alphabetically below. Abdel-Fattah. Randa Abdel-Fattah (Muslim Palestinian Australian lawyer, sociologist, academic, writer, author and activist): “After seventy years, I’m done trying to persuade people of our cause. It needs no defence, no humanisation, no legitimising. My words are no longer an argument. We won the argument at Deir Yassin, in the UNRWA refugee camps, in the buried villages, stateless generations, the billions of Western dollars cashing up what the UN, South African diplomats and former anti-apartheid activists – including Jews – have described as an “apartheid state,” the live bullets at protestors in Gaza… They kill Palestinians with bullets, missiles and bombs. But they kill many more slowly, quietly, without a trace. What is the hashtag for death by occupation?… We start to speak, to write, and we do not know when or how to stop because it is unending. The Nakba is not an anniversary, it is repeated every day across the West Bank, Gaza, Israel, the refugee camps, in the diaspora. Seventy years of bearing witness. Seventy years of millions of testimonies. We write and we speak because it is all we have left” . Akleh. Dr Elias Akleh (an Arab Palestinian American whose family was evicted from Haifa in the 1948 Nakba and evicted from the West Bank in the 1967 Naksa) on the latest Gaza Massacres: “Israel’s history demonstrates clearly that Israel is a perpetual warmongering terrorist state since its illegal inception. Through an elitist, supremacist, racist and genocidal path a majority of world Jewry had been brainwashed to adopt the terrorist Zionist ideology. This ideology had led Jewish terrorist groups to perpetrate hundreds of genocidal crimes against peaceful Palestinian villagers, totally wiping their towns off the world map, ethnically cleansing 800,000 Palestinians out of their homeland and establishing the terrorist state of Israel, that has, and is still violating hundreds of UNSC resolutions, waging wars of terrorism and aggression against its Arab neighbors, and is perpetrating war crimes and crimes against humanity against Palestinian civilians, last of which was the deliberate murder of 63 civilian peaceful Palestinian demonstrators and the severe wounding of 3000 others in mere one day of Monday May 14th… Since the beginning of the March of Return, March 30th, until today Israeli army with 100 snipers on Gaza border had intentionally and deliberately murdered 116 peacefully demonstrating Palestinians and wounded more than 12,000 others including press reporters and medics. They have used tear and chemical gas, rubber coated bullets, and exploding hollow-pointed bullets to perpetrate yet a new massacre against Palestinians. This massacre reflects the terrorist nature of Israel. Israel was founded on terror and genocide against Arabs especially against Palestinians” . Albanese. Anthony Albanese (leading Australian Labor Opposition figure and Shadow Minister for Transport and Infrastructure) criticizing the Australian “No” vote against UN Human Rights Council investigation of the Gaza Killings: “International law requires a proportionate response, and those people who have guns on one side and, on the other side has rocks, the people with guns have a responsibility to act in a way which is proportionate and people have seen this acted out on their television screen in the last week. Certainly, I think the government needs to explain why it has opposed this independent investigation” . Ardern. Jacinda Ardern (New Zealand Prime Minister): “You will recall at the time the United States announced they would be moving their representation to Jerusalem we stated at that time strongly that we did not believe that would take us closer to peace and it hasn’t. As we’ve seen, the results of the protests along the border at Gaza has been devastating. It is the right of any nation to defend their border, but this is a devastating, one-sided loss of life. We would condemn the violence that has occurred and it’s plain to see the effects of this decision and the ramifications are wide reaching” . Ashrawi. Dr Hanan Ashrawi (PLO Executive Committee Member) on latest Gaza Massacres: “On the same day that the United States officially relocated its embassy to occupied Jerusalem, Israel murdered 55 unarmed Palestinians, including children, and injured 2,000 more who were protesting America’s illegal and disastrous move, commemorating the 70th anniversary of the Palestinian Nakba (“Catastrophe”) and affirming the right of return for Palestinians. We urgently appeal to all members of the international community to stop the bloodshed against the captive people in Gaza immediately. We also urge the High Contracting Parties to the Fourth Geneva Convention and the ICC to convene and investigate Israel’s gross violations and flagrant war crimes. This deliberate massacre, as well as other massacres committed by Israel, should not go unpunished” . Baroud. Dr Ramzy Baroud (a Palestinian journalist, author, activist and editor of “Palestine Chronicle”) on the latest Gaza Massacres: “The Israelis and their American friends are dancing. They are celebrating while my people have dug 58 more graves just today. They have danced on our graves for far too long” . Corbyn. Jeremy Corbyn (UK Labour Opposition leader): “[Palestinian deaths an] outrage… hold those responsible to account… slaughter… [IDF has] wanton disregard for international law… [Western governments must] demand an end to the multiple abuses of human and political rights Palestinians face on a daily basis, the 11-year siege of Gaza, the continuing 50-year occupation of Palestinian territory and the ongoing expansion of illegal settlements” . Countries boycotting the opening of the US Embassy in Jerusalem. Those 50 countries with embassies in Apartheid Israel (black mark) which were invited but which did not attend (good mark) included Argentina, Australia, Belarus, Belgium, Belize, Bosnia-Herzegovina, Brazil, Bulgaria, Canada, Chile, China, Colombia, Costa Rica, Croatia, Cyprus, Denmark, Ecuador, Egypt, Eritrea, Finland, France, Germany, Ghana, Greece, India, Ireland, Italy, Japan, Jordan, Kazakhstan , Latvia, Liberia, Lithuania, Mexico, Moldova, Myanmar, Netherlands, Norway, Paraguay, Poland, Portugal, Russia, Slovakia, Slovenia, South Africa, South Korea, Spain, Sri Lanka, Sweden, and the United Kingdom . Di Natale. Dr Richard Di Natale (Leader of the Australian Greens): “The Australian Greens condemn in the strongest possible terms this latest example of the Israeli military’s excessive use of force. Yesterday marked the deadliest day in Gaza since the 2014 war, with more than 50 Palestinians killed. We are distressed that almost 100 mostly unarmed Palestinian protestors have reportedly been killed by Israeli forces since the end of March on the border with Gaza, including at least four minors and two journalists. It is deplorable that the Liberal and Labor parties have remained silent in the face of the Israeli Government’s excessive use of force. What will it take for them to speak up? They must condemn this disproportionate response against Palestinians exercising their legitimate and important right to engage in non-violent protest. Donald Trump’s decision to move the US Embassy to Jerusalem is a body blow to the peace process and the Palestinian people. Trump is intent on inflaming tensions, yet the Turnbull Government has repeatedly refused to stand with the rest of the world and speak out against this move. It’s well past time for both the old parties to recognise the state of Palestine alongside the state of Israel” . Erekat. Saeb Erekat (senior West Bank Palestinian official): “These war crimes should not go unpunished and the international community has a responsibility to provide international protection for the Palestinian people” . Freeland. Chrystia Freeland (Canadian foreign affairs minister: “It is inexcusable that civilians, journalists + children have been victims. All parties to the conflict have a responsibility to ensure civilians are protected” . Larison. Daniel Larison (writer for The American Conservative): “The Trump administration’s response to today’s massacre of unarmed protesters in Gaza by Israeli forces was as appalling as we would expect it to be: the Trump administration blamed Hamas for the deaths of dozens of Palestinians killed by Israeli soldiers on Monday during mass protests along the boundary fence, the deadliest day of violence since the 2014 Israel-Gaza conflict. We know that the Trump administration consistently indulges U.S. clients and encourages them in their worst behavior, but the refusal to hold Israel accountable for obvious, egregious crimes like this one is nonetheless breathtaking and despicable. Hamas bears responsibility for its own crimes and misrule, but it is ludicrous to hold them responsible when Israeli forces shoot live ammunition into a crowd of unarmed people. The administration’s attempt to shift the blame from the government that killed nearly five dozen unarmed protesters and wounded hundreds more to anyone else is similar to their responses to Saudi coalition crimes in Yemen: ignore them for as long as possible, absurdly claim that the client state is acting in “self-defense,” and when all else fails find some other group or government to blame for things that the client has done. Refusing to hold Israel responsible for its crimes guarantees that there will be more of them in the weeks and months to come. As long as the administration doesn’t object to this excessive and illegal treatment of Palestinians, the Israeli government will assume that it has Trump’s full support and will keep doing more of the same. The Trump administration is giving Israel a green light to shoot Palestinian protesters, and its determination to ensure that there is “no daylight” between our two governments means that there is practically nothing that the Israeli government can do that this administration won’t tolerate” . Le Drian. Jean-Yves Le Drian (French Foreign Minister) speaking to the French Parliament: “The situation in the Middle East is explosive, violence is doing the talking, war could loom. We are committed to the security of Israel but Israel’s security cannot justify this level of violence… We [also] have a disagreement about the method. Because in both cases [including Jerusalem embassy] the United States decided to act unilaterally” . Levy. Gideon Levy (anti-racist Jewish Israeli writer for Haaretz ): “When will the moment come in which the mass killing of Palestinians matters anything to the right? When will the moment come in which the massacre of civilians shocks at least the left-center? If 60 people slain don’t do it, perhaps 600? Will 6,000 jolt them? When will the moment come in which a pinch of human feeling arises, if only for a moment, toward the Palestinians? Sympathy? At what moment will someone call a halt, and suggest compassion, without being branded an eccentric or an Israel hater? When will there be a moment in which someone admits that the slaughterer has, after all, some responsibility for the slaughter, not only the slaughtered, who are of course responsible for their own slaughter? Sixty people killed didn’t matter to anyone – perhaps 600 would? How about 6,000? Will Israel find all the excuses and justifications then also? Will the blame be laid on the slain people and their “dispatchers” even then, and not a word of criticism, mea culpa, sorrow, pity or guilt will be heard?” . Mabaya. Ndivhuwo Mabaya (South African Department of International Relations spokesperson) re the indefinite recall of the South Africa Ambassador Sisa Ngombane in response to the latest 2018 Gaza Massacres (shades of the 1960 Sharpeville Massacre in Apartheid South Africa)(2018): “Given the indiscriminate and gravity of the latest Israeli attack, the South African government has taken a decision to recall Ambassador Sisa Ngombane with immediate effect until further notice… [government condemned] in the strongest terms possible the latest act of violent aggression carried out by Israeli armed forces along the Gaza border. [This] led to the deaths of over 40 [people] killed following a peaceful protest against the provocative inauguration of the US embassy in Jerusalem… [Israeli Defence Force] must withdraw from the Gaza Strip and bring to an end the violent and destructive incursions into Palestinian territories. South Africa maintains further that the violence in the Gaza Strip will stand in the way of rebuilding Palestinian institutions and infrastructure” . Mansour. Riyad Mansour (ambassador of the permanent observer mission of the State of Palestine to the UN): “We condemn in the strongest terms this odious massacre committed by Israel occupation forces… [Israeli] occupation is the main source of violence in the region, for those who do not acknowledge it live in a different reality. Let us investigate what’s happening on the ground… Palestinians will accept the findings come what may…. [US embassy move to Jerusalem] provocation… [Trump allows Israel to] commit more crimes against the Palestinian people [with] impunity… [The US] should not close their eyes to situation on the ground” . Mondoweiss. Mondoweiss (anti-racist Jewish American website) on Gaza killings (14 May 2014): “Today is unfolding as a horrifying and tragic day in Palestine. The Israeli military has opened fire on Gaza protesters as the U.S. and Israeli governments prepare to mark the move of the U.S. embassy to Jerusalem. Today has been the deadliest day in Gaza since the end of Operation Protective Edge in 2014. According to the Gaza Ministry of Health (as of 21:00 GMT): 58 killed, including 7 minors and 1 paramedic; 2,771 injured – including 225 minors, 11 journalists, 17 paramedics; 130 in serious and critical condition; 1,359 shot by Israeli soldiers using live Israeli ammunition. Since the beginning of the Great March of Return on March 30th, 107 Palestinians have been killed, almost 3,400 protesters have been shot with live ammunition, and almost 13,000 injured” . Riemer. Dr Nick Riemer (Australian literature and linguistics academic: “Australia, Israel’s best friend. Cannan’s attitude is nothing new. On his visit to Australia in 2017, Netanyahu said that ‘there is no better friend [than Australia] for the state of Israel’. He wasn’t greatly exaggerating. The UN committee that drafted the 1947 Partition resolution creating Israel was chaired by an Australian, HV Evatt, as local politicians often remind us. A glance at Australia’s recent UN voting record speaks volumes about Australia’s position on the “extreme fringe” of world opinion on Israel. In a 2012 vote making Palestine a UN non-member state, we abstained. In 2013, when a record 162 countries called for a stop to “all Israeli settlement activities in all of the occupied territories” and condemned any attempts to desecrate the Al-Aqsa Mosque, we abstained. We even voted against a UN resolution declaring the following year, 2014, the International Year of Solidarity with the Palestinian People. Faced with a proposal in the UN Security Council demanding Israel end the occupation of Palestinian territories within two years, we abstained. At the same time, the Abbott government took the extraordinary step of ruling out using the term ‘occupied’ when describing Israeli settlements in East Jerusalem. In 2016, Australia indicated it didn’t support the UN Security Council resolution condemning the construction and expansion of settlements. Last year, when the UN passed a resolution in December condemning the projected move of the US embassy to Jerusalem, we abstained. Protests are necessary, but they can seem a weak gesture in the face of the carnage on the Gaza boundary. Since the first Great Return March a month and a half ago, around ninety people have been killed by IDF snipers. The victims include at least two journalists and five children. As of midnight Sydney time on Monday, no less than 40 protesters had been killed, and over 900 injured in Gaza on that day alone. … Israel’s actions have been documented and denounced by organisations like Medicins Sans Frontiere and Human Rights Watch. Yet, true to form, Western leaders, Australia’s included, have stayed eloquently silent. That silence expresses better than words the moral bankruptcy over Israel that has long been normalised within the Western ruling class. The US lobby group Jewish Voice for Peace recently took out newspaper advertisements noting that as of May 10, only 21 out of 535 members of Congress had spoken out against Israeli brutality during the Great March of Return protests” . Sanders. Senator Bernie Sanders (I-Vt.) issued the following statement after more than 50 Palestinians were killed and 2,200 wounded by Israeli troops along the border fence with Gaza on Monday, 14 May 2018: “More than 50 killed in Gaza today and 2,000 wounded, on top of the 41 killed and more than 9,000 wounded over the past weeks. This is a staggering toll. Hamas violence does not justify Israel firing on unarmed protesters. The United States must play an aggressive role in bringing Israel, the Palestinian Authority, Egypt and the international community together to address Gaza’s humanitarian crisis and stop this escalating violence” . Shorten. Bill Shorten (Australian Labor Opposition Leader) on the latest Gaza Massacres (2018): “I think it is dreadful what we’ve seen . In particular when you see the death of children. No good comes of that. No good comes from that at all. That’s a disaster. We are urging restraint from Israel. We also support a 2 state solution and we believe that aggression by any party puts back the cause of peace and doesn’t promote it” . Singh. Jagmeet Singh (Leader of the National Democratic Party, NDP, of Canada): “Our government has been shamefully silent on recent developments in Gaza, and the prime minister should condemn the violence, call on Israel to cease violations of international law, and support an independent investigation into these deaths… [Canada must] call on the government of Israel to end this occupation. Illegal killings, arbitrary and abusive detention, forced displacement, restrictions on movement, the expansion of illegal settlements, collective punishment and institutionalized discrimination have characterized this occupation that has persisted for over half a century” . South Africa. South Africa’s Department of International Relations in a statement on the Gaza killings: “The South African government condemns in the strongest terms possible the latest act of violent aggression carried out by Israeli armed forces along the Gaza border, which has led to the deaths of over 40 civilians. The victims were taking part in a peaceful protest against the provocative inauguration of the U.S. embassy in Jerusalem. This latest attack has resulted in scores of other Palestinian citizens reported injured, and the wanton destruction of property” . Stein. Dr Jill Stein (Green Party 2016 candidate for President, anti-racist Jewish American activist, medical doctor, and environmental health advocate. ): “ Israel killing scores of Palestinian protesters in Gaza isn’t a “clash”, it’s a massacre. A US-backed massacre of an occupied people crying out for their human rights. The occupation of Palestine is an atrocity. Stop $10 million/day US support for Israeli military NOW” . Trudeau. Justin Trudeau: “Canada deplores and is gravely concerned by the violence in the Gaza Strip that has led to a tragic loss of life and injured countless people. We are appalled that Dr. Tarek Loubani, a Canadian citizen, is among the wounded — along with so many unarmed people, including civilians, members of the media, first responders, and children. We are doing everything we can to assist Dr. Loubani and his family, and to determine how a Canadian citizen came to be injured. We are engaging with Israeli officials to get to the bottom of these events… Reported use of excessive force and live ammunition is inexcusable. It is imperative we establish the facts of what is happening in Gaza. Canada calls for an immediate independent investigation” . Thornberry. Emily Thornberry (UK Labour Opposition Shadow Foreign Secretary) re Gaza killings: “[Condemned the Israeli government for] brutal, lethal and entirely unjustified actions on the Gazan border… These actions are made all the worse because they come not as the result of a disproportionate over-reaction to one day’s protests, but as a culmination of six weeks of an apparently systemic and deliberate policy of killing and maiming unarmed protestors and bystanders who pose no threat to the forces at the Gaza border, many of them shot in the back … and many of them children” . UN Human Rights Council. UN Human Rights Council (the UN’s top human rights body) has voted to send a team of international war crimes investigators to probe the killing and wounding of Gaza protesters by Israeli forces. UN Human Rights Council Resolution on Gaza Massacres: “[to] urgently dispatch an independent, international commission of inquiry… [It must] investigate all alleged violations and abuses … in the context of the military assaults on large-scale civilian protests that began on 30 March 2018” [ 29 members voted Yes, US and Australia voted No, 14 countries Abstained, and 2 countries Did Not Register]. 29 countries voting Yes: Afghanistan, Angola, Belgium, Brazil, Burundi, Chile, China, Cote D’Ivoire, Cuba, Democratic Republic of Congo, Ecuador, Egypt, Iraq, Kyrgyzstan, Mexico, Nepal, Nigeria, Pakistan, Peru, Philippines, Qatar, Saudi Arabia, Senegal, Slovenia, South Africa, Spain, Tunisia, United Arab Emirates, and Venezuela; 2 countries voting No: Australia and the United States of America; 14 countries Abstaining: Croatia, Ethiopia, Georgia, Germany, Hungary, Japan, Kenya, Panama, Republic of Korea, Rwanda, Slovakia, Switzerland, Togo, and United Kingdom; 2 countries which Did Not Register: Mongolia and Ukraine. In addition, 10 of the council’s 15 members wrote to UN secretary-general to express serious concern that the 2016 UNSC Resolution 2334 demanding an end to Israeli settlement building on occupied land was not being implemented: “The Security Council must stand behind its resolutions and ensure they have meaning; otherwise, we risk undermining the credibility of the international system,” wrote Bolivia, China, Ivory Coast, Equatorial Guinea, France, Kazakhstan, Kuwait, the Netherlands, Peru and Sweden in a joint letter . UN Security Council. Draft resolution for the UNSC meeting called for by Kuwait re the Gaza killings: “The Security Council expresses its outrage and sorrow at the killing of Palestinian civilians exercising their right to peaceful protest. The Security Council calls for an independent and transparent investigation into these actions to ensure accountability…all sides to exercise restraint with a view to averting further escalation and establishing calm… [actions] which purport to have altered the character, status or demographic composition of the Holy City of Jerusalem have no legal effect” . US opposition effectively vetoed passage of the resolution . .Zomlot. Hussar Zomlot (Palestinian Ambassador to the US): “The US silence is license to kill for Israel, and Israel is taking this license to her and implementing it in full. Failing to speak up is a dent in the moral history of this country” . Hussar Zomlot issued the following statement re the US Embassy shift to Jerusalem: “Today will go down in history as the day the U.S. encouraged Israel to cross the line towards what numerous U.S. and international leaders have been warning from: A full-fledged apartheid. The reality has evolved into a system of privileging one group and continuing to deny the human and national rights, all granted by international law, of over 12 million Palestinians” . Ambassadors to Apartheid Israel. Of 83 countries with embassies in Apartheid Israel and invited to the celebrations only 33 attended, namely Albania, Angola, Austria, Cameroon, Congo, the Democratic Republic of the Congo, Ivory Coast, Czech Republic, Dominican Republic, El Salvador, Ethiopia, Georgia, Guatemala, Honduras, Hungary, Kenya, Macedonia, Burma, Nigeria, Panama, Peru, the Philippines, Romania, Rwanda, Serbia, South Sudan, Thailand, Ukraine, United States, Vietnam, Paraguay, Tanzania and Zambia . Burst. Alistair Burt (UK Minister for the Middle East): “[Palestinian death toll] extremely worrying… [ Israel should] show greater restraint… [UK would] not waver from our support for Israel’s right to defend its borders” . Alistair Burt issued a statement on Twitter: “Extremely saddened by loss of life in Gaza today. Concerned peaceful protests are being exploited by extremist elements. Urge restraint in use of live fire. Violence is destructive to peace efforts.UK remains committed to a two-state solution with Jerusalem as a shared capital” . France. France (one of the UN Security Council’s 5 permanent members: “ [condemned] the violence of Israeli armed forces against demonstrators”  (a position softened by President Emmanuel Macron). Johnson. Boris Johnson (UK Foreign Secretary): “There has got to be restraint in the use of live rounds” . Macron. Emmanuel Macron (French President) in a statement to war criminal Netanyahu according to the Elysee Palace: “He expressed his very deep concern about the situation in Gaza, condemned the violence and underlined the importance of protecting civilian populations and of the right to protest peacefully” . May. Theresa May (UK Prime Minister) via a spokesperson (May 2018): “The UK remains firmly committed to a two-state solution with Jerusalem a shared capital. We are concerned by the reports of violence and loss of life in Gaza. We urge calm and restraint to avoid actions destructive to peace efforts” [35, 52]. Merkel. Angela Merkel (German Chancellor) statement re the Gaza killings to war criminal Netanyahu as reported by a spokesman “[Expressed her] concerns about the escalation of violence… [understands] the security concerns of Israel… The right to freedom of expression and peaceful assembly should not be abused to provoke unrest. Violence should not be a means to enforce political goals” . UN Human Rights Council members voting No, abstaining or not registering over proposed investigation of Gaza killings. The UN Human Rights Council Resolution on Gaza Massacres: “[to] urgently dispatch an independent, international commission of inquiry… [It must] investigate all alleged violations and abuses … in the context of the military assaults on large-scale civilian protests that began on 30 March 2018” ( 29 members voted Yes, but US and Australia voted No, 14 countries Abstained, and 2 countries Did Not Register). The 14 countries Abstaining included Croatia, Ethiopia, Georgia, Germany, Hungary, Japan, Kenya, Panama, Republic of Korea, Rwanda, Slovakia, Switzerland, Togo, and the UK), and the 2 countries that Did Not Register were Mongolia and Ukraine . US senators. Sen. Bernie Sanders (I-Vt.) and 12 of his Democratic Senate colleagues (Sens. Dianne Feinstein (D-Calif.), Patrick Leahy (D-Vt.), Thomas Carper (D-Del. ), Sherrod Brown (D-Ohio), Chris Van Hollen (D-Md. ), Elizabeth Warren (D-Mass. ), Martin Heinrich (D-N.M.), Jeff Merkley (D-Ore.), Tom Udall (D-N.M.), Sheldon Whitehouse (D-R.I.), Jack Reed (D-R.I.) and Edward Markey (D-Mass.)) in a letter to Secretary of State Mike Pompeo: “[Pompeo] should do more to alleviate the ongoing humanitarian crisis in the Gaza Strip… The territory’s lack of power, clean water, adequate medical care and other necessities not only exacerbates the hardships faced by Gaza’s population, but redounds to the benefit of extremist groups who use this deprivation and despair to incite violence against Israel… The political and security challenges in Gaza are formidable, but support for the basic human rights of its people must not be conditioned on progress on those fronts. For the sake of Israelis and Palestinians alike, the United States must act urgently to help relieve the humanitarian crisis in the Gaza Strip. We stand ready to work with you on this important matter”. Sanders added a statement: “In light of yesterday’s horrific violence in Gaza, in which more than 50 Palestinians were killed and more than 2,000 were wounded by Israeli snipers, it’s important to understand the desperate situation out of which these protests have arisen. That is why I, along with 12 of my Senate colleagues, have sent a letter to the secretary of state making clear that the United States must play a leading role in addressing the situation” . Abbott. Tony Abbott (former Prime Minister of Australia betrayed and replaced as PM by Malcolm Turnbull) supporting the US Embassy move: “The US embassy is now in West Jerusalem, which has been Israel’s capital for nearly 70 years. Australia should consider following Trump’s move”  (noting that Apartheid Israel has war criminally incorporated East Jerusalem and its Indigenous Palestinian inhabitants into a forcibly and war criminally unified Jerusalem and into Apartheid Israel in gross violation of numerous UN Resolutions, the UN Charter, the UN Genocide Convention and the Geneva Convention; the violently incorporated Indigenous Palestinians cannot vote in Israeli elections) . Australia. Australia shamefully voted No to the UN Human Rights Council Resolution on Gaza Massacres “[to] urgently dispatch an independent, international commission of inquiry… [It must] investigate all alleged violations and abuses … in the context of the military assaults on large-scale civilian protests that began on 30 March 2018’ . Bishop. Julie Bishop (Coalition Australian Foreign Minister) released the following detailed statement after the latest series of Israeli Gaza Massacres that was entitled “Palestinian protests in Gaza” (2018): “The Australian Government expresses its deep regret and sadness over the loss of life and injury during the continuing protests in Gaza. We recognise that Israel has legitimate security concerns and needs to protect its population, and we call on Israel to be proportionate in its response and refrain from excessive use of force. Australia urges Palestinian protesters to refrain from violence and attempting to enter into Israeli territory during the March of Return. The violence underlines the importance of a return to negotiations toward a two-state solution so an enduring peace can be found. The Australian Government is committed to a future where Israel and a Palestinian state exist side-by-side in peace and security, within internationally recognised borders” . Conricus. Lt Col Jonathan Conricus (a spokesperson for the genocidally racist and war criminal IDF): “[Since 30 March] only 1 soldier slightly wounded by shrapnel…[no Palestinian incursion] Our troops have not taken any sustained direct fire”  (In stark contrast Mohammed Nabieh ( a descendant of refugees from a village near Israeli Ashdod) stated of the protest: “I’m here because of our land that we want back. We have nothing to lose,” Nobody cares about us. Why should we wait to die slowly?” . Conservative Friends of Israel (CFI). Lord Polak CBE (CFI Honorary President) and James Gurd (CFI Executive Director) said: “The ongoing events on the Israel-Gaza border are truly heart breaking, and the loss of lives deeply concerning. What makes the matter worse is Hamas’s cynical manipulation of a legitimate protest to further its well-documented violent and genocidal intentions towards Israeli citizens, which is deplorable. In the face of attempts to breach the border and attack civilians, Israel (like any other country) has the right to self-defence. We hope there will be no further casualties and we urge restraint on all sides” . Danon. Danny Danon ( permanent representative of Apartheid Israel to the UN) addressing the UN Security Council: “Hamas terrorists are hiding behind civilians during the riots. When it comes to the safety of the Israeli public, too often, the world is silent. The Palestinian leadership is using every ounce of its leadership to attack us and destroy us… [Palestinian authorities] killing their own people [and] playing a public relations game… [Palestinians] always choose violence”  [Note: no Palestinians penetrated the Gaza Concentration Camp fence and no Israelis were killed or injured, 1 Israel soldier “slightly wounded by shrapnel”]. Erdan. Gilad Erdan (Apartheid Israeli minister of Strategic Affairs): “Israel does not wish to escalate and doesn’t want the death of residents of the Gaza Strip. Those who want this are solely the leadership of the Hamas terrorist organization, which uses a cynical and malicious use of bloodshed. The number of killed doesn’t indicate anything – just as the number of Nazis who died in the world war doesn’t make Nazism something you can explain or understand” . Gurd. Lord Polak CBE (CFI Honorary President) and James Gurd (CFI Executive Director) said: “The ongoing events on the Israel-Gaza border are truly heart breaking, and the loss of lives deeply concerning. What makes the matter worse is Hamas’s cynical manipulation of a legitimate protest to further its well-documented violent and genocidal intentions towards Israeli citizens, which is deplorable. In the face of attempts to breach the border and attack civilians, Israel (like any other country) has the right to self-defence. We hope there will be no further casualties and we urge restraint on all sides” . Hastie. Andrew Hastie (former soldier, Australian Liberal Party and Coalition Government backbencher and chairman of the parliamentary joint committee on intelligence and security) backed the call by former PM Tony Abbott for the Turnbull Coalition government to follow the US lead and move its embassy to Jerusalem . Kushner. Jared Kushner (Trump’s wealthy and fanatically Jewish Zionist son-in-law as husband of Ivanka Trump) (May 2018): “As we have seen from the protests of the last month and even today those provoking violence are part of the problem and not part of the solution” . Labour Friends of Israel. The UK Labour Friends of Israel group said: “It is clear after yesterday’s terrible death toll that the violence on the Gazan border has to stop. Hamas must end its cynical exploitation of peaceful protests to launch attacks on Israel and we would urge the IDF to ensure they take all measures necessary to minimise civilian casualties and show restraint” . May. Theresa May (UK Prime Minister) via a spokesperson (May 2018): “The UK remains firmly committed to a two-state solution with Jerusalem a shared capital. We are concerned by the reports of violence and loss of life in Gaza. We urge calm and restraint to avoid actions destructive to peace efforts” . Netanyahu. Benjamin Netanyahu (serial war criminal Prime Minister of Apartheid Israel) blaming Hamas for the Gaza killings: “Every country has an obligation to defend its borders. The Hamas terrorist organisation declares it intends to destroy Israel and sends thousands to breach the border fence in order to achieve this goal. We will continue to act with determination to protect our sovereignty and citizens” . Polak. CFI Honorary President Lord Polak CBE and CFI Executive Director James Gurd said: “The ongoing events on the Israel-Gaza border are truly heart breaking, and the loss of lives deeply concerning.What makes the matter worse is Hamas’s cynical manipulation of a legitimate protest to further its well-documented violent and genocidal intentions towards Israeli citizens, which is deplorable. In the face of attempts to breach the border and attack civilians, Israel (like any other country) has the right to self-defence. We hope there will be no further casualties and we urge restraint on all sides” . Pompeo. Mike Pompeo (US Secretary of State) re the Gaza Massacres “[The US] does believe the Israeli’s have the right to defend themselves and we’re fully supportive of that” . Regev. Mark Regev (Australian Israeli and Israeli ambassador to the UK) defending the war criminal IDF response in the Gaza Massacres: “We used live fire in only a very measured way in a very surgical way” . Shah. Raj Shah (White House deputy press secretary) at news conference re Gaza killings (15 May 2018): “We believe that Hamas is responsible for these tragic deaths, that their rather cynical exploitation of the situation is what’s leading to these deaths, and we want them to stop… We think that we shouldn’t lose sight of the fact that Hamas is the one that, frankly, bear [sic] responsibility for the dire situation right now in Gaza…We believe Hamas, as an organization, is engaged in cynical action that’s leading to these deaths. This is a gruesome and unfortunate propaganda attempt… [Mike Pompeo agrees that] Israel has the right to self-defense” [52, 59]. Sharma. Dave Sharma (former Australian ambassador to Israel) has called on the Turnbull government to consider recognising Jerusalem as the capital of Israel even if it does not move the embassy from Tel Aviv . Turnbull. Malcolm Turnbull (fervent Christian Zionist and Australian Coalition Prime Minister who betrayed and replaced former PM Tony Abbott) disgracefully blaming the victim in his comments on the latest Gaza Massacres (2018): “This is Hamas pushing people to the border, pushing them with Israel, pushing them to challenge the border, to try to get through the border. It’s it is it’s it is it’s tragic, Any loss of life is like this or any loss of life is tragic in these circumstances, but Hamas’ conduct is confrontational, they are seeking to provoke the Israeli defence forces… We;;, they’re pushing people to the border in an area in, you know, in context in that conflict zone you’re basically pushing people into circumstances where they are likely to be shot as Israel seeks to defend itself” . However Malcolm Turnbull reiterated his government’s opposition to shifting the Australian embassy to Jerusalem:“We have taken the view — as indeed, most countries have — that it’s more conducive to the peace process to keep the embassy in Tel Aviv. Obviously, the status of Jerusalem and negotiations relating to Jerusalem are a key part of the peace negotiations, which we wish the very best for and which we support” . Trump. Racist warmonger US President Donald Trump has moved the US Embassy to Jerusalem thereby endorsing the war criminal Apartheid Israeli incorporation of East Jerusalem and its Indigenous Palestinian inhabitants into a forcibly and war criminally unified Jerusalem and into Apartheid Israel in gross violation of numerous UN Resolutions, the UN Charter, the UN Genocide Convention and the Geneva Convention, noting that the violently incorporated Indigenous Palestinians cannot vote in Israeli elections) . Through his various spokespeople Trump has blamed the Gaza protestors for getting killed [52, 59]. UN Human Rights Council members voting no over proposed investigation of Gaza killings. The UN Human Rights Council Resolution on Gaza Massacres: “[to] urgently dispatch an independent, international commission of inquiry… [It must] investigate all alleged violations and abuses … in the context of the military assaults on large-scale civilian protests that began on 30 March 2018” – 29 members voted Yes, 14 countries Abstained, and 2 countries Did Not Register but the US and Australia voted No . The US voted No to the UN Human Rights Council Resolution on Gaza Massacres “[to] urgently dispatch an independent, international commission of inquiry… [It must] investigate all alleged violations and abuses … in the context of the military assaults on large-scale civilian protests that began on 30 March 2018” . Peace is the only way but silence kills and silence is complicity – the world must speak out and take action over the latest Gaza Massacres. 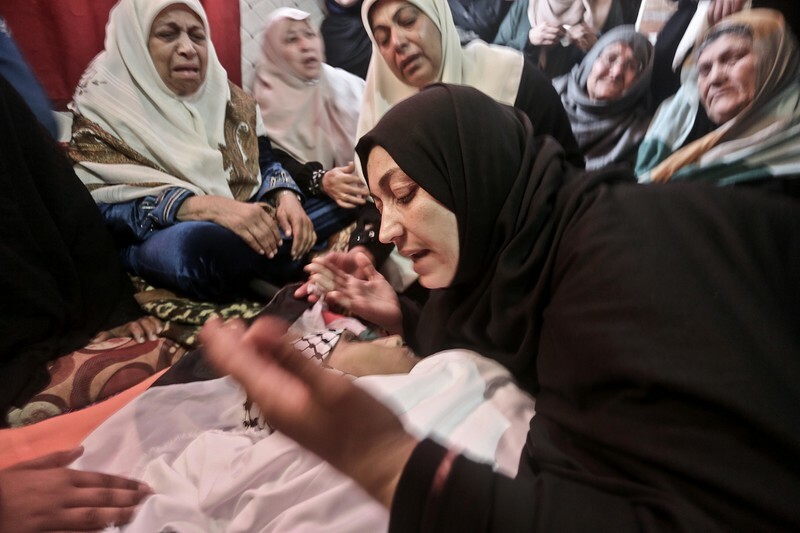 As senior West Bank Palestinian official, Saeb Erekat, has stated of the latest Gaza Massacres: “These war crimes should not go unpunished and the international community has a responsibility to provide international protection for the Palestinian people” . Highly respected Amnesty International has specifically argued for an international arms embargo against Apartheid Israel: “Israel is carrying out a murderous assault against protesting Palestinians, with its armed forces killing and maiming demonstrators who pose no imminent threat to them, Amnesty International revealed today, based on its latest research, as the “Great March of Return” protests continued in the Gaza Strip…Amnesty International has renewed its call on governments worldwide to impose a comprehensive arms embargo on Israel following the country’s disproportionate response to mass demonstrations along the fence that separates the Gaza Strip from Israel”. Implicit in US, UK, French, German and Australian support for Apartheid Israel in its latest Gaza atrocities is entrenched racism in these countries. Political correctness means that the US Alliance racism cannot be explicitly articulated after the fashion of the genocidally racist Zionists (for an alphabetical compendium of such obscenities see  ). However the ultimate in racism is genocide and the penultimate is invasion of other countries, noting that historically the US has invaded 72 counties as compared to the British 193, Australia 85, France 82, Germany 39, Japan 30, Russia 25, Canada 25, Apartheid Israel 12 and China 2 and North Korea arguably none [25, 61-65]. With no such PC inhibitions, in 1937 Winston Churchill – a racist, imperialist, warmonger, mass murderer and architect of the 1942-1945 WW2 Bengali Holocaust in which the UK with Australian complicity deliberately starved to death 6-7 million Indians [66-72] – told the Palestine Royal Commission: “I do not admit for instance, that a great wrong has been done to the Red Indians of America or the black people of Australia. I do not admit that a wrong has been done to these people [Palestinians] by the fact that a stronger race, a higher-grade race, a more worldly wise race to put it that way, has come in and taken their place” . The US and US lackey Australia are number 1 and number 2, respectively, in the world as supporters of Apartheid Israel and hence of the gross human rights abuse, Nazi-style Apartheid and ongoing Palestinian Genocide of this nuclear terrorist, racist Zionist-run, genocidally racist, democracy-by-genocide and pariah rogue state. If Apartheid Israel and its associates get away with this latest Gaza Massacre – mass murder of unarmed protestors as in the 1960 Sharpeville Massacre by Apartheid Israel-backed Apartheid South Africa – then Apartheid Israel is one step closer to a conceivable and indeed Zionist-promoted  “Final Solution” by Expulsion applied to its now 50% Indigenous Palestinian subjects. Decent people around the World must act urgently by (a) informing everyone they can and (b) urging and applying Boycott, Divestment and Sanctions (BDS) against Apartheid Israel and all its supporters, most notably racist Zionists, pro-Apartheid America and pro-Apartheid Australia.
. “Dozens killed in Gaza clashes as US opens Jerusalem embassy”, SBS News, 15 May 2018: https://www.sbs.com.au/news/dozens-killed-in-gaza-clashes-as-us-opens-jerusalem-embassy .
. “UN votes to send war crimes investigators to Gaza”, Al Jazeera, 19 May 2018: https://www.aljazeera.com/news/2018/05/votes-send-war-crimes-investigators-gaza-180518142752946.html .
. Gideon Polya, “Apartheid Israel & Pro-Apartheid US, Australia & Canada face world sanctions over East Jerusalem”, Countercurrents, 20 December 2017: https://countercurrents.org/2017/12/20/apartheid-israel-pro-apartheid-us-australia-canada-face-world-sanctions-over-occupied-east-jerusalem/ .
. Shlomo Sand, “The Invention of the Jewish People”.
. Randa Abdel-Fattah, “Living the Nakba: testimonies of trauma, loss, rage and hope”, ABC, 10 May 2018: http://www.abc.net.au/religion/articles/2018/05/10/4841570.htm .
. Elias Akleh, “With Israel peace has no chance”, Countercurrents, 21 May 2018: https://countercurrents.org/2018/05/21/with-israel-peace-has-no-chance/ .
. Amy Remeikis, “Albanese demands explanation why Australia voted against Gaza inquiry”, The Guardian, 20 May 2018: https://www.theguardian.com/australia-news/2018/may/20/labor-asks-why-australia-voted-against-gaza-violence-inquiry .
. Claire Trevett, “PM Jacinta Ardern: Gaza deaths show US Embassy move to Jerusalem hurt chance for peace”, New Zealand Herald, 15 May 2018: https://www.nzherald.co.nz/nz/news/article.cfm?c_id=1&objectid=12051727 .
. Dr Hanan Ashrawi, “PLO Executive Committee Member Dr. Hanan Ashrawi appeals to the international community to stop Israel’s ongoing massacre in Gaza”, Embassy of the State of Palestine, 15 May 2018: http://www.palestine-australia.com/highlights/news/2018/plo-executive-committee-member-dr-hanan-ashrawi-appeals-to-the-international-community-to-stop-israels-ongoing-massacre-in-gaza/ .
. Ramzy Baroud, “Ramzy Baroud speaking at the rally for Gaza in Sydney (VIDEO)”, Ramzy Baroud, 15 May 2018: http://www.ramzybaroud.net/ramzy-baroud-speaking-at-the-rally-for-gaza-in-sydney-video/ .
. Lee Harpin, “Deaths in Gaza are an “outrage” says Jeremy Corbyn as he backs review of arms sales to Israel”, The JC, 15 May 2018: https://www.thejc.com/news/uk-news/deaths-in-gaza-are-an-outrage-says-jeremy-corbyn-as-he-backs-review-of-arms-sales-to-israel-1.464178 .
. Noa Landau, “These are the countries planning to participate in Israel’s celebrations of U.S. Embassy move”, Haaretz, 16 May 2016: https://www.haaretz.com/middle-east-news/these-countries-participating-in-israel-s-gala-for-u-s-embassy-move-1.6077598 .
. “Greens condemn Palestinian deaths at Gaza border”, The Greens, 15 May 2018: https://greens.org.au/news/vic/greens-condemn-palestinian-deaths-gaza-border .
. “Turkey-Israel row: video of airport frisking deepens tensions”, Al Jazeera, 16 May 2018: https://www.aljazeera.com/news/2018/05/turkey-israel-row-video-airport-frisking-deepens-tensions-180516092623378.html .
. Peter Zimonjic, “Freeland calls on “all parties” involved in Gaza violence to protect civilians””, CBC News, 14 May 2018: http://www.cbc.ca/news/politics/freeland-israel-violence-gaza-embassy-1.4663014 .
. Daniel Larison, “The Trump Administration’s despicable response to the Gaza Massacre”, The American Conservative, 14 May 2018: http://www.theamericanconservative.com/larison/the-trump-administrations-despicable-response-to-the-gaza-massacre/ .
. Amanda Holpuch and Matthew Weaver, “Gaza: Nakba Day protests as Palestinians bury those killed in embassy unrest – live updates”, The Guardian, 16 May 2018: https://www.theguardian.com/world/live/2018/may/15/gaza-israel-nakba-day-protests-as-palestinians-bury-those-killed-in-embassy-unrest-live-updates .
. Gideon Levy, “60 dead in Gaza and the end of Israeli concscience”, Haaretz, 17 May 2018: https://www.haaretz.com/opinion/.premium-60-dead-in-gaza-and-the-end-of-israeli-conscience-1.6095178 .
. Kaveel Singh, “SA pulls ambassador out of Israel over Gaza violence”, News24, 14 May 2018: https://www.news24.com/SouthAfrica/News/sa-pulls-ambassador-out-of-israel-over-gaza-violence-20180514 .
. “Live blog: massacre in Gaza as US and Israel celebrate embassy move to Jerusalem”, Mondoweiss, 14 May 2018: http://mondoweiss.net/2018/05/massacre-celebrate-jerusalem/ .
. Nick Riemer, “Nakba Day: The Palestinian slaughter goes on but the path ot peace is still possible”, New Matilda, 15 May 2018: https://newmatilda.com/2018/05/15/nakba-day-palestinian-slaughter-goes-path-peace-still-possible/ .
. “Sanders statement on Gaza violence”, Bernie Sanders, 14 May 2018: https://www.sanders.senate.gov/newsroom/press-releases/sanders-statement-on-gaza-violence .
. “Malcolm Turnbull blames Hamas for “tragic” Gaza deaths”, Sky News, 15 May 2018: https://www.skynews.com.au/details/_5784881475001 .
. Dr Jill Stein, Twitter, 15 May 2018: https://twitter.com/drjillstein/status/996077442493280256 .
. John Paul Tasker, “Trudeau calling for independent probe of reported use of “excessive force” in Gaza shootings”, CBC News, 16 May 2018: http://www.cbc.ca/news/politics/trudeau-statement-gaza-independent-investigation-1.4665858 .
. Chris Baynes, “US “blocks UN motion” calling for investigation into Israeli killing of Gaza protesters”, Independent, 15 May 2018: https://www.independent.co.uk/news/world/middle-east/gaza-protests-latest-israel-palestine-trump-blocks-un-security-council-statement-investigation-a8352006.html .
. Caitlin Doherty, “”Israel has right to defend itself” – Donald Trump blames Hamas for Gaza deaths”, Express, 15 May 2018: https://www.express.co.uk/news/world/959789/israel-right-defend-itself-donald-trump-hamas-palestine-jerusalem-embassy-opens .
. Primrose Riordan , “Turnbull, US blame Hamas for death of Palestinians in Gaza”, The Australian, 16 May 2018: https://www.theaustralian.com.au/national-affairs/malcolm-turnbull-us-blame-hamas-for-gaza-deaths/news-story/33b0f13802211bd05358b91ec3098d29 .
. “France’s Macron tells Netanyahu Palestinians have right to protest peacefully”, Reuters, 16 May 21081: https://www.reuters.com/article/us-israel-palestinians-macron/frances-macron-tells-netanyahu-palestinians-have-right-to-protest-peacefully-idUSKCN1IG2IO .
. Nadine Schmidt, “Merkel expresses concern over Gaza violence in call with Netanyahu”, CNN, 15 May 2018: https://edition.cnn.com/middleeast/live-news/gaza-funerals-protests-intl/ .
. “Sanders leads call to address humanitarian crisis in Gaza”, Bernie Sanders, 16 May 2018: https://www.sanders.senate.gov/newsroom/press-releases/sanders-leads-call-to-address-humanitarian-crisis-in-gaza .
. Julie Bishop, “Palestinian protests in Gaza”, Media release, 15 May 2018: https://foreignminister.gov.au/releases/Pages/2018/jb_mr_180515.aspx .
. Oliver Holmes and Hazem Balousha, “Israel faces outcry over Gaza killings during Jerusalem embassy protests”, The Guardian, 15 May 2018: https://www.theguardian.com/world/2018/may/14/israel-tells-palestinians-they-are-risking-lives-in-us-embassy-protests .
. Alex Ward, “White House absolves Israel of all responsibility in Gaza deaths”, Vox, 15 May 2018: https://www.vox.com/2018/5/14/17353154/israel-palestinians-deaths-embassy-white-house-hamas .
. Amnesty International “Israel: arms embargo needed as military unlawfully maims and kills Gaza protestors”, Amnesty International 27 April 2018: https://www.amnesty.org/en/latest/news/2018/04/israel-arms-embargo-needed-as-military-unlawfully-kills-and-maims-gaza-protesters/ .
. Gideon Polya, “President Hollande And French Invasion Of Privacy Versus French Invasion Of 80 Countries Since 800 AD”, Countercurrents, 15 January, 2014: http://www.countercurrents.org/polya150114.htm ).
. “Stop state terrorism”: https://sites.google.com/site/stopstateterrorism/ .